Tonnes of funky mech news coming through the funky mech tubes this week. First, Double Fine’s Iron Brigade is hitting Steam on Monday – that’s got mechs in. Then, free to play Chrome app AirMech is getting a Steam release – that’s got mechs in the title. And now, Heavy Gear is making a triumphant, metallic return to our screens, having last appeared in two Activision games in 1997 and 1999. Canadian studio Stompy Bot Productions and publisher Dream Pod 9 announced their exclusive licensing of the franchise for a new PC game based on the Heavy Gear universe. It will definitely have mechs in. Precisely squat all else is known about the title beyond its mooted development. “We’re very excited to bring Heavy Gear back to the current generation of gaming fans,” said Stompy Bot’s president James Taylor, reassuringly. 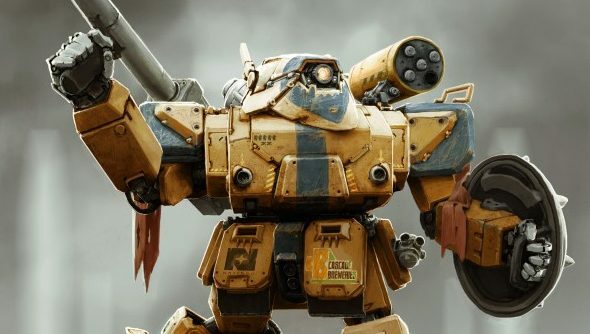 With a studio name like Stompy Bots, I’d be worried if you weren’t excited about bringing Heavy Gear back to the frontlines. Dream Pod 9’s president said something similar in a press release, revealing nothing of the game itself. On your bingo cards, you may strike off: “looking forward”, “working closely”, “next incarnation”, “drive and talent”, “bring the world to life”, “all our fans” and “whole new generation of gamers”. Here’s what Heavy Gear 2, spiritual successor to a bloodline of the MechWarrior games,looked like in 1999. This was ahead of its time, with heavily customisable mechs creating a broad range of option in competitive combat. The mechs could also scoot about on little rollerblades.